Although true bypass has been a standard for boutique pedal companies for the last decade, in more recent years many companies (including my own), moved from using a mechanical 3PDT switch (triple pole, double throw) to a relay with a momentary switch to achieve true bypass. From a technical perspective, using relay true bypass is a more complicated design. 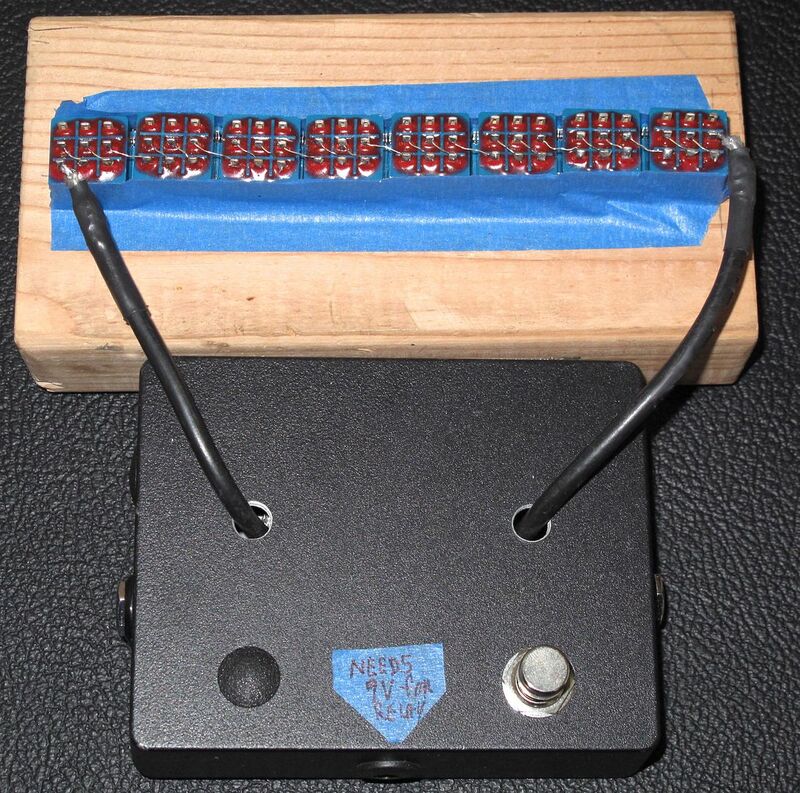 It requires more components, but electrically is superior to a mechanical switch because it is designed for the audio signals found in pedals, and (if designed properly) will minimize audible popping as the switch is turned on/off. Alternatively, a mechanical switch (3PDT) is designed for high current/high voltage signals, and has the propensity for a popping discharge when switching on/off as a result of its integration into a circuit. Theoretically, this makes a mechanical switch undesirable for pedals. That is, at least on paper. Over the last year our process engineer and I set up various tests to determine the affect of the mechanical 3PDT switches when compared to the relays for true bypass. We knew that electrically there were significant advantages to using relays over mechanical switches, however, what remained unclear were their audible differences. In order to make this determination, we set up a test fixture that switches between eight (8) relays in series (equivalent to eight pedals with relay true bypass) and eight (8) mechanical switches in series (equivalent to eight pedals with mechanical true bypass). *The switches used for this experiment were Fujitsu Takamisawa relays and Cliff 3PDT switches. * A five-foot (5’) Vertex instrument cable was used going from guitar to test fixture, and a ten-foot (10’) cable going from test fixture to amp. None of the subjects could consistently (more than 50% of the time) identify a difference between the relay and mechanical true bypass. Although electrically relays are superior to mechanical switches, the difference was not audible to our test subjects or us. It calls into question the extra cost and components necessary to manufacture pedals using relay true bypass. A common concern about relay true bypass is that it requires many components for a single function (switching a pedal on/off), therefore increasing the probability for failure. While manufacturers understand this, they still choose relays for the perceived sonic superiority over mechanical switches. Perhaps hearing the audible difference between relay and mechanical true bypass may influence manufacturing choices, because without the tonal benefit of a relay, why incur the added expense? It is worth noting that there are circumstances where relay true bypass is necessary with certain stereo pedals and pedals with multiple switching functions. Relays have their place; however, they may not be practical for a simple mono analog distortion device with 4-5 controls and an on/off switch.